Clean chard by tearing the outer leaves off of middle stem. Stack the leaves on top of each other and roll into a log. Cut the leaves into 1 inch ribbons and chop the stems into 2 inch pieces. 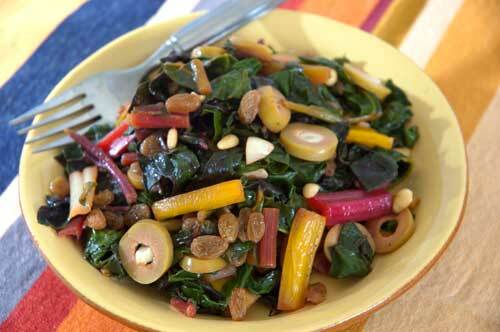 Place all the cut chard into a large bowl of cold water. The debris will fall to the bottom of the water bowl and the leaves will be left clean. Gently pull the leaves from the water and place into a colander to drain. In a large sauce pan on medium heat, add the olive oil and heat. Add the chard to the pan with the chicken stock, golden raisins, and sliced olives. Cook until leaves and stems are tender, about 7-9 minutes.